This Equity Template will allow you to calculate a company’s book value and market value of equity using the accounting method and financial analysis method. In finance and accounting, equity is the value attributable to the owners of a business. The book value of equity is calculated as the difference between assets and liabilities on the company’s balance sheet, while the market value of equity is based on the current share price (if public) or a value that is determined by investors or valuation professionals. The account can also be called shareholders/owners/stockholders equity or net worth. 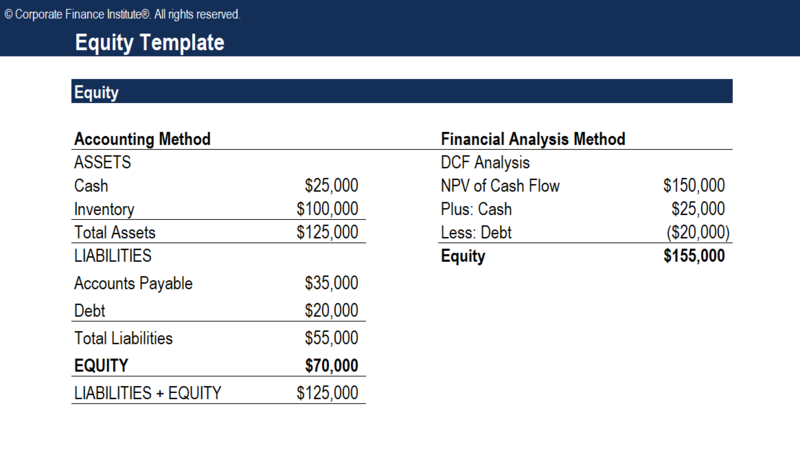 In this equity calculation example, the accounting method takes the difference between the assets and liabilities on the balance sheet and arrives at a value of $70,000. In the financial analysis method, an analyst builds a DCF modelDCF Model Training Free GuideA DCF model is a specific type of financial model used to value a business. DCF stands for Discounted Cash Flow, so the model is simply a forecast of a company’s unlevered free cash flow discounted back to today’s value. This free DCF model training guide will teach you the basics, step by step with examples and images and calculates the net present value (NPV) of the free cash flow to the firm (FCFF). This gives us the enterprise value of the firm (EV) which has cash added to it and debt deducted from it to arrive at the equity value of $155,000. Note that the market value of equity is usually higher than the book value of equity.